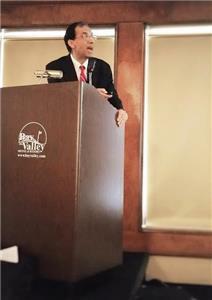 Chattanoogan Dr. Anuj Chandra was a keynote speaker at the Michigan Academy of Sleep Medicine Annual Conference. He presented an overview of Pediatric Sleep Medicine. MASM’s annual conferences provide continuing medical education for sleep medicine professionals who travel from all over the United Sates to attend. It was held in Bay City, Mi. with approximately 200 attendees. The other keynote speaker was Dr. Alon Y. Avidan, professor of Neurology at UCLA School of Medicine. Among the other speakers was Dr. George Kipa, corporate medical director of Blue Cross Blue Shield of Michigan. He presented a lecture on telemedicine, a form of practice being used increasingly more in the foreseeable future because it enhances accessibility and promotes better time management for providers. Dr. Chandra’s presentation covered many issues that impact the pediatric population. These include sleep disordered breathing, nightmares, insomnia, abnormal sleep behaviors, sleep hygiene and more. One to five percent of children have sleep apnea. This is a potentially life-threatening condition that is treatable, but has often been overlooked. Sleep apnea has been linked to ADHD, behavioral problems, obesity, and early-onset high blood pressure and diabetes. The American Academy of Pediatrics recommends that children be screened for sleep apnea, and that clinicians investigate further if a child snores and has other signs of sleep disordered breathing. “It was an honor to be invited to speak on behalf of such a vulnerable patient population," said Dr. Chandra. "Sleep disorders in children and teens can be much more nuanced and apt to be misunderstood." As part of his mission to create a greater understanding of sleep health, Dr. Chandra plans to continue presenting at events like the MASM conference. He is founder and medical director of the Advanced Center for Sleep Disorders, a comprehensive sleep diagnostic facility that has served the greater Chattanooga area for over a decade. This was just one of many ongoing efforts by Dr. Chandra and his staff to increase awareness of sleep disorders affecting the child and adolescent population. Anita Newsom RN, BSN, Sleep Medicine coordinator, and Dr. Laura Vargas, M.D., chief clinical coordinator, are actively working to increase the already long-established outreach of Advanced Center for Sleep Disorders. For more information visit www.sleepforhealth.org, or call Ms. Newsom or Dr. Vargas at 648- 8008.